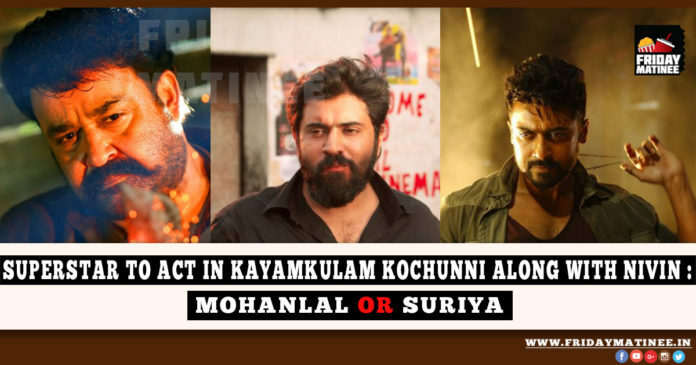 SuperStar's Cameo in Kayamkulam Kochunni: Mohanlal or Surya ? Home News Malayalam SuperStar’ s Cameo in Kochunni :Mohanlal or Surya? One of the most expected movie of the year is none other than Nivin Pauly’s Kayamkulam Kochunni directed by Roshan Andrews and produced by Gokulam Gopalan under the banner of Sree Gokulam Films.The script of the same is penned by the highly talented Bobby-Sanjay. SuperStar’s Cameo in Kayamkulam Kochunni: Mohanlal or Surya ? Now the news coming in that is there is an important cameo role in the movie.Tje role is that of Kochunni ‘s Mentor. There will be only 15 minutes of screen time for that character,but it will make a big impact it seems. The makers wished to have Suriya playing the role,but he was unable to allocate 15 days as per makers need. Then they approached Mohanlal for the same.He give a positive nod straight away and will do the character mostly.We still awaits an Official Confirmation from the makers on the same. The movie is expected to hit theatres in Summer 2018 and Anto Joseph will be the Distributor of the same. Previous articleWCC Gets It Wrong This Time! !